So I will keep it short. Watch it if you like comedy with a little bit of action and also if you like bad guys ruling over his mortal classmates. If you are person who likes Sci-Fi, economics, or politics, you should definitely go ahead and give this anime a try. This anime certainly is a 3 episode try for most anime watchers. The anime tries to have serious events then comedic then serious again, however the politics / economics side of the anime is pretty rare and interesting aspect. This series has a distinct setting where the series takes place on Mars. There is a good cast of characters that have unique personalities that sets them apart from each other, but pretty generic compared to other anime's. The animation is above average, nothing super spectacular. The intro song is good as well. Some people will like this, some will dislike this, for me I'm pretty hooked on this anime. this was a god first episode that was full of action and stunning visuals the animation did look good as did the character models the only thing that slightly put me off was the pacing but that might have been because it was the first episode either way this is a series worth watching. This episode sets the scene for the series - it is very exciting and has a very cool concept that utilizes high school students in a work setting - in space! Very high tech and new era setting. - excited for next episode! I also like the character design and how the homeroom teacher is an active part of the students involvement in school. Often you can tell how much you are going to like a series just by watching its' first episode. This series definitely has that enthralling trait. The art is beautiful and very fluid and the characters have a very diverse persona. Cute and funny toons keep your interests. Only one obvious shipping so far, and it'll be a very unique pairing if they take off. The subtlety of leaving certain questions unanswered makes the storytelling feel natural and DOES NOT FORCE-FEED you the whole darn plot in a bland monologue. First Impressions: Rocket Science High School? *Disclaimer* These are my impressions after watching episode one. Classroom Crisis is a tough nut to crack. It's got comedic elements, complete with ridiculous reaction face shots. It's got sci-fi, with space ships and planetary colonization. It's got the standard high school classroom setting. And it's got...sinister corporate politics? Alrighty then. Normally I'd give a speed synopsis, but there's too many odd elements for that to happen in a timely fashion. So instead I'll jump right to the heart of the matter: did the first episode hook me? While the sci-fi/high school/corporation setting is interesting, the characters are extremely two-dimensional so far. Already we have the standard cliches of quiet, monotone girl, clueless-but-earnest young male teacher, and soulless, badass boy genius. No character has broken the mold by adding anything unique or fresh. Regardless of how crazy your setting is, if the characters inhabiting it are copy/pasted from the book of overused anime tropes, the show won't take off. I can't comment on the plot at this point, as the narrative isn't established yet. It's certainly fine to take several episodes to set up the story, but again, the characters must grab the audience and keep them coming back for more until the plot takes off. 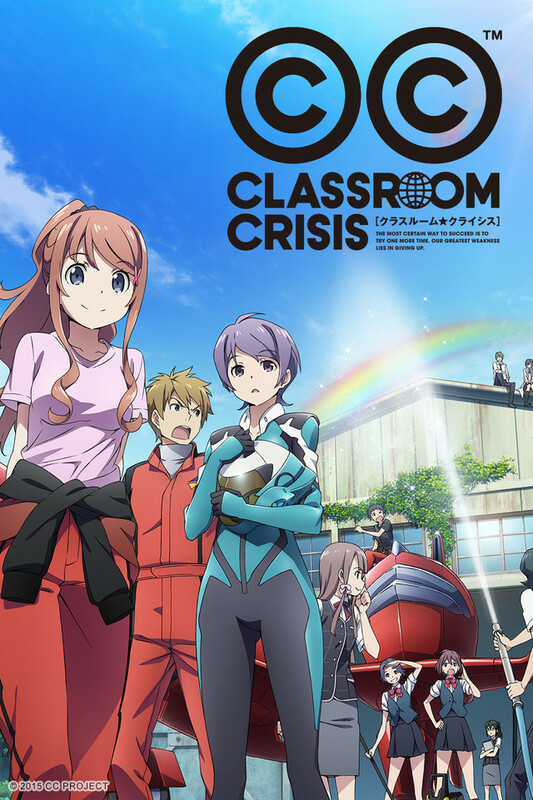 I'll give Classroom Crisis another couple of episodes, but unless the characters start developing personalities overnight or the plot is incredibly engaging, I don't have high hopes for this show taking off. From watching the first episode I can already tell that this anime will have a large number of fans. Normally, I'm not into SciFi so I decided to watch the first episode to renew the genre for me. I did not get what I expected! Not only was there SciFi, there was economics and politics, both some of my favorite subjects. Also, the animation was my preferred type which is always good From just watching episode one I am already very interested in it! I sincerely hope that this turns out to be very popular and that there will be more anime similar to it to come out soon! Quick youtube review of the first ep. I made a short anime review on the first ep. This is basically what I said about it. This anime takes place in a futuristic high school and is about a top secret class of engineers and pilots working on experimental spacecraft for the Kirishina Corporation. Every student is some sort of child prodigy and the class has been using an outrageous amount of money. The new student to this class is the son of the CEO and is on a mission to remove the class and prove it’s negligence. The animations quality isn’t bad, and the spaceship parts were pretty cool, but the characters seemed kind of dull to me. The premise of the show is kind of ridiculous, but the show doesn’t take it’s self too seriously so that’s not entirely too bad. There’s not much that’s shown in the first episode, so I guess I’ll watch the second episode of this one to see if it gets any better but my hopes are not high for this anime. It’s a sci fi anime which I like, but it doesn’t seem to be very good. So if you’re not into wacky high school sci fi, then don’t bother with this one. I’m giving it my meh rating which is basically a 3/5. It’s not bad, but it’s not any good either. Hopefully the next episode proves me wrong. Gave up midway 3rd episode.. The selling point of this anime is definitely its characters and the world built around them. Contrary to some other reviews, I found the main cast to be entertaining, especially the dynamic between the two main leads: the naive engineering genius Kaito Sera and the world-wise business prodigy Nagisa. It's interesting to watch Kaito, a protagonist that is, like so many others, naive and idealistic, and yet is also capable and quick to learn and adapt. His growth comes through in the form of learning to be business savvy like Nagisa, and this corporate maneuvering works well to keep the show entertaining. But the real draw of the show for me is the anti-hero Nagisa. He's introduced as a ruthless and ambitious businessman, poised to take over the company by any means necessary, and Kaito's engineering division is just another small thing he needs to overcome. But at the same time, it's suggested that he's secretly maneuvering to help Kaito and that there's some grand master plan in the works. Four episodes in, and where exactly they're going with this is unclear, but it's fun to pick up on the hints of what's going to happen. It's a pretty solid show that tries to capture the process of growth of young adults(students) being thrown into the very different world of business and real life. The world they live in is one practically owned and created by corporations, as if to highlight this point. Excited to see where it goes in the future; would definitely recommend for anybody looking for something a little different.